Chose this product on the strength of a recommendation by a electrical engineer. I have used this charger for over a month and have not been disappointed. Good build quality and easy to read instructions. 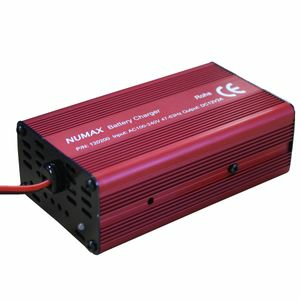 I bought the battery charger after being advised by your team that the 5am charger I had was too powerful for the battery I bought, and would strongly recommend the 2am charger that you sell - on this advice I bought the charger, however, speaking to an electric trolley manufacturer and retailer - that company's opinion was that the 5amp was ok - I feel that your advice was centred more on making a sale than having my full interests at heart. Great product, can leave battery connected and rely on a full charge always. Brilliant quality and very durable, so far working really well. The light system of displaying charge is also very useful. Thank you. Excellent piece of equipment Charged battery efficiently with no problem. Given 4 stars as delivery was a day after quoted date. VG, ten out of ten (picture in product description wrong though). Odering, Payment & Shipment was flawless, only the chargers were much larger and clunkier than I thought, the power chord is also permanently attached which was displayed differently on the photo. Great service, Great price and fast delivery. Very easy to use, literally plug in and charge. Seems to do what it says on the tin. Battery is being kept charged on the bike whilst the bike is garaged.